Steve joined The Davis Companies in March 2017 as a Managing Director. Steve brings over 25 years of institutional commercial real estate industry experience to the position. Steve leads equity capital raising for all company investment and development initiatives. He oversees the Investor Relations team and has primary responsibility for all investor communications, as well as managing, maintaining and expanding The Davis Companies’ investor, consultant and distribution relationships. Steve also leads developing and implementing the marketing and public relations strategy and materials for the Company, its funds and other investment vehicles. Prior to joining The Davis Companies, Steve was a Portfolio manager at Bentall Kennedy in Boston, where he was responsible for portfolio management, sourcing new opportunities, and researching investment opportunities. Steve headed private real estate investing at Cohen & Steers from 2008 through 2013, where he functioned as the Chief Investment Officer for Global Realty Partners. From 2002 through 2008, Steve was a Managing Director at Citigroup Property Investors (CPI), where he was CPI’s Chief Investment Strategist, heading all global research and investment strategy decisions, and was also the founder and portfolio manager of Citigroup Real Estate Partners. Prior to joining Citigroup, Mr. Coyle was a Principal and the Senior Strategist at Property & Portfolio Research, a leading edge, independent research firm based in Boston. From 1990 to 1996, Steve was a Vice President in Research for TCW/Westmark Realty Advisors (now CB/Richard Ellis Investors). Steve has been published in many journals, including Real Estate Finance, Mortgage Banking, and the Real Estate Finance Journal. 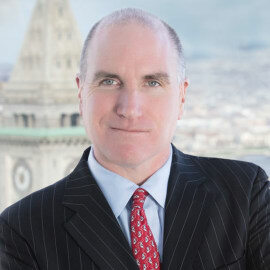 Steve is an active lecturer on U.S. property markets, and has written articles for and been quoted in numerous journals and newspapers, such as The Financial Times, Bloomberg News, The Wall Street Journal, Institutional Real Estate Letter, Real Estate Finance and Investment, IPE Real Estate, Reuters, Boston Globe, Business Week and Fortune. Mr. Coyle has been appointed to many prestigious industry organizations. Steve is currently the Co-Chair of PREA’s Capital Markets Affinity Group and from 2013 through 2016 was the Chairman of ULI’s IOPC Blue Council. Steve is a former member of the Board of Directors for the Association of Foreign Investors in Real Estate, the Pension Real Estate Association’s Research Committee, Real Estate Research Institute’s Advisory Board, and The Institutional Real Estate Letter’s Editorial Board. Mr. Coyle received a B.A. in Economics and German from Hampden-Sydney College, and an M.A. in Economic Policy from Boston University.